ECB Tells Deutsche Bank To Simulate A "Crisis Scenario"
... in its Monday edition, Suddeutsche Zeitung reports that the ECB has asked that Deutsche Bank simulate what a "crisis scenario" would look like, and what it would cost to complete a "resolution", i.e. wind-down, of its own investment banking division. While DB's calculations have reported been taking place for several months, SZ notes that this is the first time that the ECB supervisory authority has demanded such a measure from a major bank. The German publication also notes that the ECB will demand similar simulations of other banks. According to the report, banking regulators want to know what the impact would be on the value of Deutshe Bank's capital market and derivatives business if, as a solvent bank, it had to simulate an abrupt end to new business. One possible need for such a simulation may stem from the recent termination of CEO John Cryan, and his replacement with Christian Sewing, a lifelong retail banker, who some have speculated may seek to wind-down Deutsche Bank's i-Banking division. To be sure, in order to avoid a panic that the ECB is preparing for the worst and simulating a full-blown Deutsche Bank bankruptcy, SZ adds that the exercise is not about simulating an event of bankruptcy, "which would be many times more expensive and difficult." In response to the article, the ECB said that it generally gives banks many tasks, without elaborating on the "crisis scenario" it has requested. Meanwhile, Deutsche Bank said it is routinely tasked by regulators to determine "the consequences of orderly settlement of positions in its trading books." 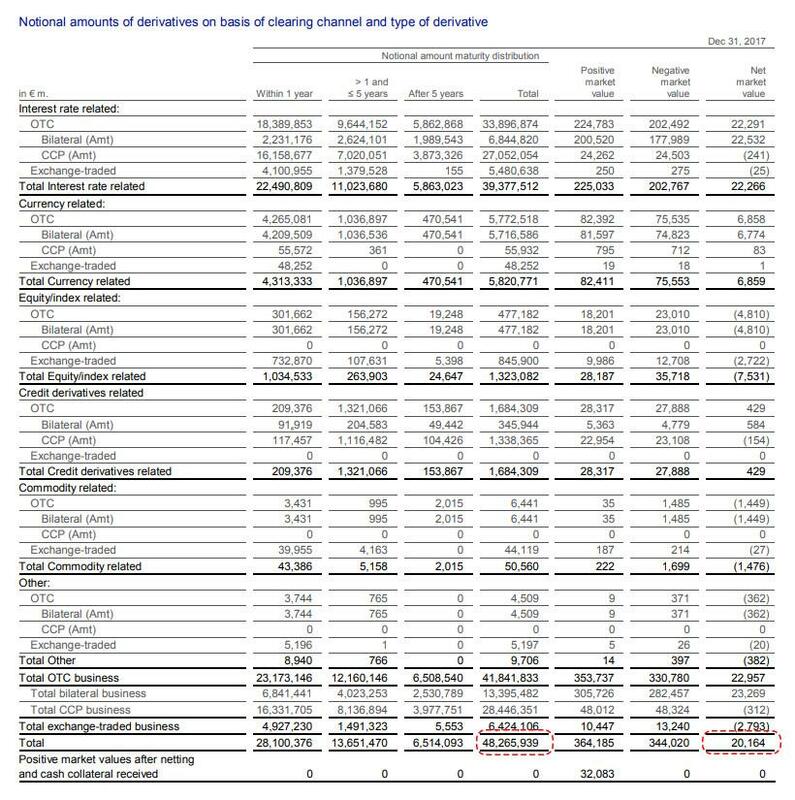 Perhaps, but never until now was Europe's biggest bank asked to quantify how the abrupt end of its banking business, with its associated €48.3 trillion in gross notional derivatives, would affect both the bank itself, and would percolate across markets.